I’ll admit it – I can’t get through the fall season by making only one recipe made with pumpkin (as good as it was). Because I love pumpkin that much, I felt the need to made something with pumpkin again this week. This recipe is apparently quite popular in the blogosphere and has been around for several years. I’m assuming that this recipe may have been based on a popular muffin at Starbucks during the fall season, although I’ve never had the muffin in question. Regardless, this version was very good and I’ll definitely make these again. 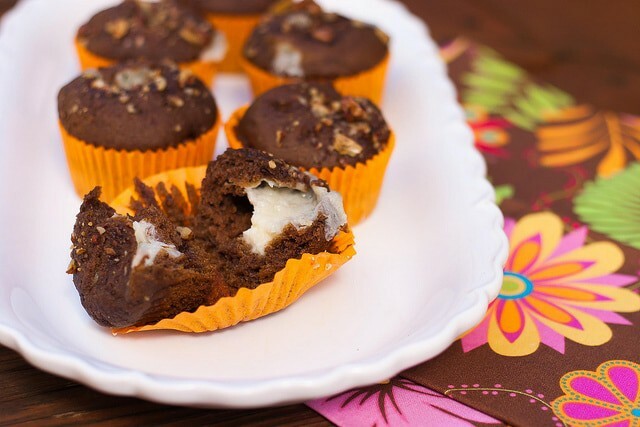 As you can see from the photo, the novel part of these muffins is the cream cheese center. 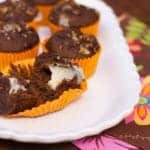 This is achieved by mixing cream cheese with powdered sugar and vanilla, shaping the whole concoction into a log, freezing it, slicing it and then strategically placing the sliced pieces into the muffin tins after they have been half-filled with pumpkin batter. Now here’s the thing: you should make sure that the cream cheese has been sufficiently frozen/cold, and that the cream cheese slices are not placed too close to the top of the muffin. You want to do this to avoid what happened to my muffins. Much to my dismay, many of my muffins had cream cheese exploding from the top after they were baked. Not pretty (but still yummy). Hey, you live and learn, right? That’s what impatience will do to you in the kitchen.. Mix the cream cheese, powder sugar, and vanilla together until well incorporated. Wrap up and freeze for about 2 hours. Line the cupcake/muffin tins with cups or grease well. Finely chop sugared pecans for topping and set aside. In a large bowl, combine the first 7 ingredients (flour, cinnamon, nutmeg, cloves, cocoa powder, baking powder, and salt) and set aside. In a separate bowl, mix the eggs, sugar, oil, and pumpkin on low speed (or whisk by hand) until combined. Add the dry ingredients and mix until combined (do not overmix). Remove the cream cheese log from the freezer and slice into 24 pieces. Allow the cream cheese to cool before eating. It will be hot!